At the top of the table sit two storied football teams that both wear black and white stripes. But we are not playing either of them this weekend. One would have to look all the way down to the bottom of the table in 17th position to find Saturday’s opponent. They are newly promoted side Siena, or the other Bianconeri. Siena have a long history of playing in Serie B or lower, enjoying only their 8th season in the top flight, they hardly have the reputation, finances, or manpower that Juve or Udinese have. Although they did have Juve’s current coach, Antonio Conte, up until this summer. But they’ve got a little something called heart, which sometimes supercedes some of those other qualities. Luckily for Milan, their success has been limited to wins against Lecce, Cesena, and Chievo, so they are hardly known as giant killers. They are also on a string of 3 straight losses, which could work for them, except they travel to the San Siro, which makes breaking that streak even less likely. Although they did knock Palermo out of the Coppa Italia for us on Tuesday on a penalty shoot-out, so maybe they are a bigger threat than they look. In his debut Serie A season as a coach, Giuseppe Sannino will be simply looking to avoid relegation. In their last league match at home vs. Genoa, he fielded a 4-4-2 lineup made up of Brkic; Contini, Terzi, Del Grosso, Vitiello; D’Agostino, Gazzi, Grossi, Brienza; with Calaiò and Destro up front. It is of note that I think only 2 of these players also played in the Coppa Italia midweek, so I would assume he will use many of these rested players. Besides D'Agostino, who really seems to like the black and white stripes, the Siena squad is made up of largely lesser known players. But there is one I will be watching, and it is striker Mattia Destro. Sure, he came up through the Inter youth system, but don’t let that deter you. He’s got 3 goals and an assist in 7 starts in the league this season at the wise old age of 20. He’s been fantastic for the Italy U21 squad, and would be on my wishlist of young strikers to bring to the proper side of Milan. "I'm coming for you, Milan." Meanwhile, in the proper side of Milan, Allegri is still juggling some injury concerns. Abbiati may not be quite fit to play in goal, so it will likely be Amelia deputizing again, who has been overall quite solid despite tasking credit for one costly goal on the weekend. Nesta is still out, and now Yepes must have surgery on his ankle and will be out for 10 weeks, so He will have to choose between Mexes and Bonera to fill in next to Silva. I would choose Mexes, but I did not lead our team to the Scudetto last year, so we’ll see who Allegri chooses. Abate should start, and I’m guessing Allegri’s choice on the left would be Antonini. Will he? Or won't he? I do hope Allegri fields a strong team and takes the match seriously, even if we also face Cagliari for that makeup match from the beginning of the season on Tuesday. Sunday showed what the slightest bit of complacency can do when you face an opponent who is hungry for a win. We need to keep Juve and Udinese honest and shake free of Lazio, too. But there’s a little team that could who would love nothing more than to help their Bianconeri brethren. 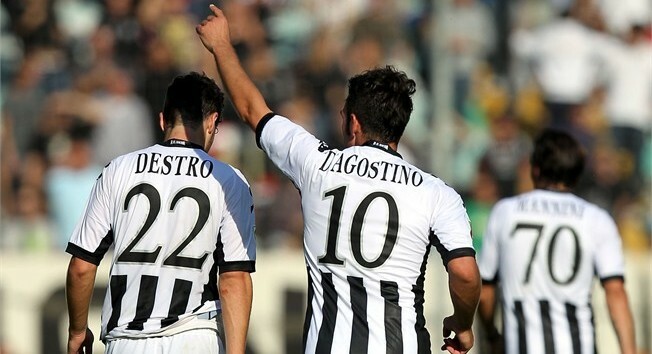 And while they are long shots to pull it off, one should never discount the other Bianconeri.